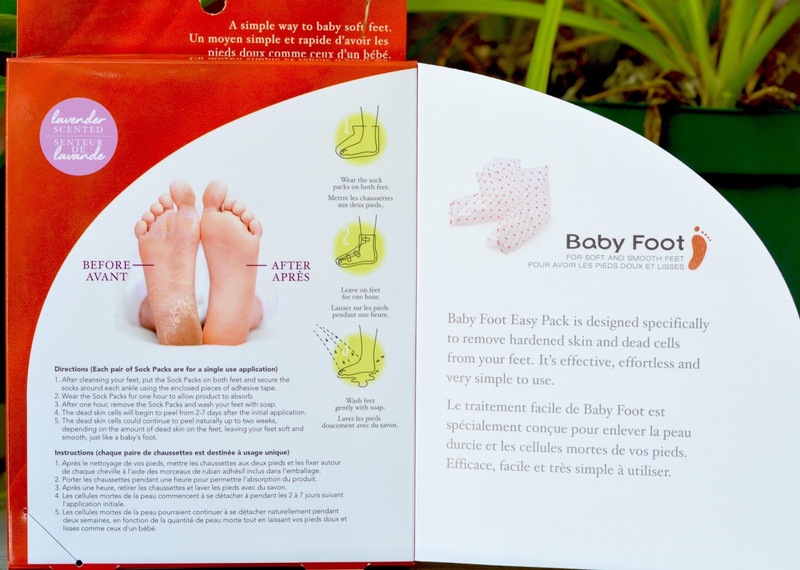 Baby Foot originated in Japan as a strong chemical peel for the feet. The ingredient list includes a long list of acids, most of them coming from natural fruit sources. After soaking your feet in this acidic liquid for an hour, the top layer of dead skin will completely peel off (on its own) over the two weeks following the treatment. So. Cool. 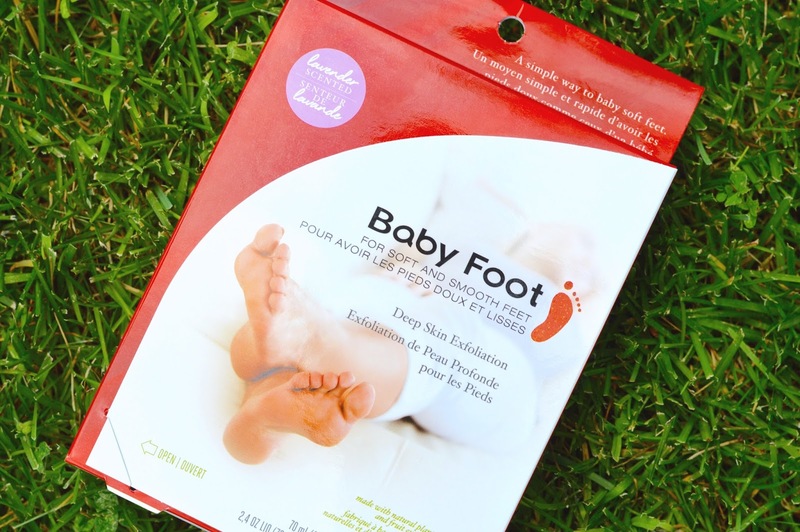 Note: Do not use Baby Foot if you are pregnant, a diabetic, or allergic to any of the ingredients listed on the box. Also, do not put the booties on if you have any cuts on your feet! 1. Grab a good book, remove any nail polish (the acid will ruin it) and soak your feet in warm water for 15-30 minutes. Dry off your (clean) feet, cut open the top of the saturated booties and slip your feet inside. 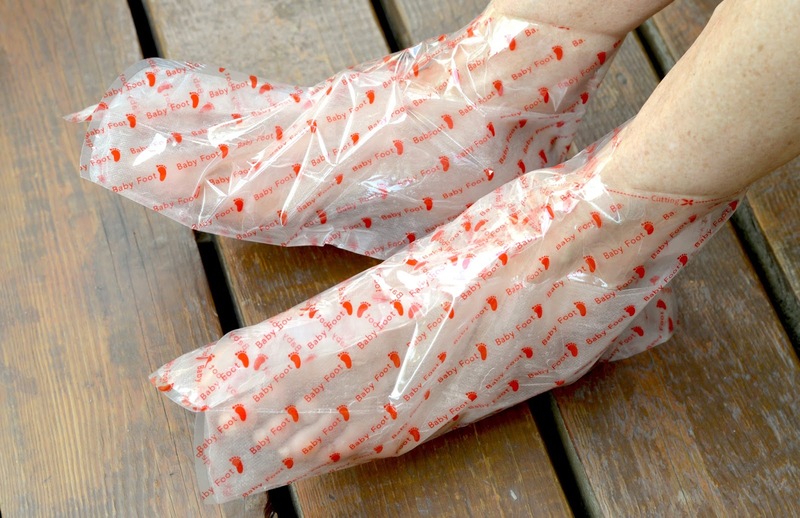 Use the adhesive strips included to secure the booties to your ankles. 2. Sit back and relax for 1 hour. You may notice a slightly cool, tingly sensation, but nothing painful or uncomfortable. 3. Once the hour is up, slide off the booties and throw them away. Wash your feet right away and do not apply any moisturizer. 4. Over the next 10-14 days try and soak your feet in warm water for a few minutes each night to loosen up the skin. Don’t attempt to speed up the peeling process since you can damage the surface of your skin if the flakes aren’t ready to come off. 5. It won’t be pretty, but allow the skin to come off on it’s own accord. Soaking in warm water repeatedly will allow the skin to dry up and flake off, and an oily moisturizer will work against that. Even on my mom’s rough heels, Baby Foot will, without a doubt, give you spa quality results from the comfort of your own home. Before doing the treatment, make sure that you plan ahead since the flaking skin will be pretty visible for at least one week. Though our experience didn't look as gross and dramatic as many other reviews online, these photos are #nofilter so the results don't lie. This one-time treatment retails for $25 on NailPolishCanada.com and ships free. I love shopping on their site, and actually documented my first purchase form them last year (see my Nail Polish Canada haul here). With the price of a pedicure being at least $30, Baby Foot is a reasonable at-home fix for those dry, rough heels. I can see the smoothness lasting at least 2-3- months, especially if you regularly apply moisturizer after showering. The fresh lavender scent was pleasant, and the process is very easy overall. Baby Foot is a definite crowd-pleaser over on our end. Are you willing to try it out? The results are totally satisfying.